Peter and Jason are two of the nicest guys I've ever meet, and they both treated me wonderfully, big thanks to them. Peter's also a genuine D&D aficionado, and I think we could talk for pretty much days swapping opinions and past history with the game. (Which is pretty fascinating having grown up in different countries; a universal language, if you will.) We also got a chance the next day to check out the American Visionary Arts Museum, a really unique exhibit space, which had been recommended by one of my other New York artist friends (thanks Sarah!). 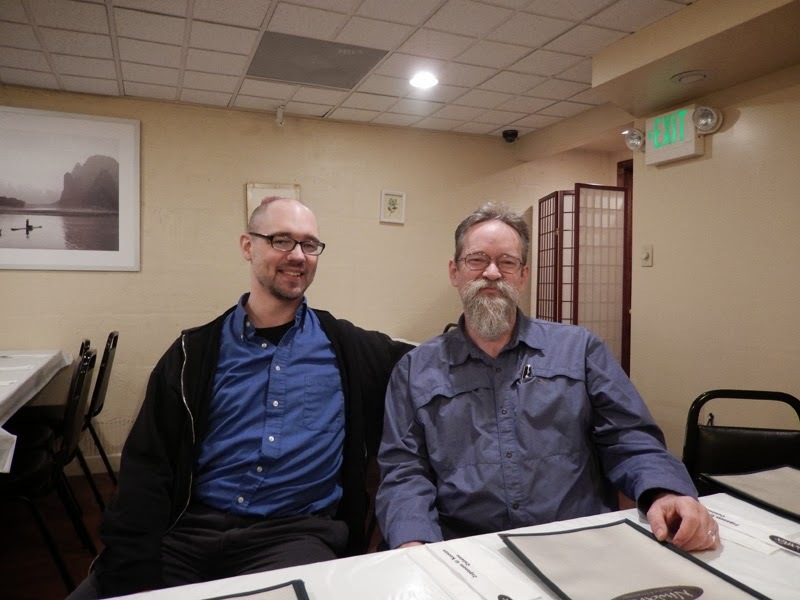 After the talk Wednesday we also went out for dinner, and coincidentally I got to meet one of my game-design idols, Mr. Dave "Zeb" Cook (you know: author of AD&D 2E, the D&D Expert Rulebook, modules X1, X4, X5, co-author of Star Frontiers, etc., etc.) He's currently living in Baltimore, working at ZeniMax on the soon-to-be-released "Elder Scrolls Online". You really couldn't ask to meet a sweeter, funnier, more personable guy -- greeted me warmly and we immediately started swapping stories and questions about games from the old days to right now. Very lucky to make his acquaintance, graciously let me take a photo with him, what a great trip! Thanks a million to Peter and everyone at JHU for making this happen. AD&D on Community, 2nd Ed.